The way of blogging on WordPress is a wonder to me. Each time I post a blog, I get to “meet” new people with amazing lives who also blog about their adventures. WordPress tells us about each other through links and suggestions. The number of people out there living really passionate lives is inspiring. One such person is Esti, a woman who is not originally from Shanghai, but who lives there now with her husband and daughter. Her blog, coffeecameralove, shares lovely pictures and stories of her explorations around the area she now calls home. She brings her readers into her world, making us feel like we are sitting across the table from each other over coffee. Esti did me the honor this week of passing along the Versatile Blogger Award and I would like to thank her for that. It has made me smile all week. Thank the blogger who has nominated you and link back to their blog in your post. Pass the award onto 7 other bloggers whose blogs you enjoy reading. Write to the bloggers you have nominated to let them know about the award. Thank the blogger who has nominated you and link back to their blog on your post. Esti, thank you, again for giving me the Versatile Blogger Award. It has been so lovely getting to know you and your family through your own blog and now you have made me feel so great by sharing this award. May your blog, coffeecameralove, ever continue to grow in readership and fun. 1. I am an Experimenter with a capital E. That’s why writing and traveling suit me so well. I like trying all sorts of things to see how they fit. Then, once I feel I have mastered the experience or learned from it, I get bored and move on. In my bolder moments, I like to think of myself as walking in the shadows of Leonardo di Vinci. In my humbler moments, I think I might just be somebody with Attention Deficit Disorder. Either way, I like trying new things. 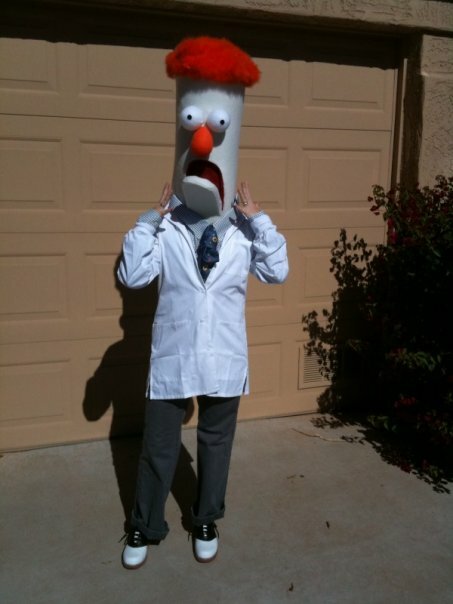 I made this Beaker costume after I got inspired one year around Halloween. That's really me in there! Experiment: Success. Lesson learned: I can make Muppets! And: Never wear a Beaker costume to your nephew's 1st birthday party. It scares them. 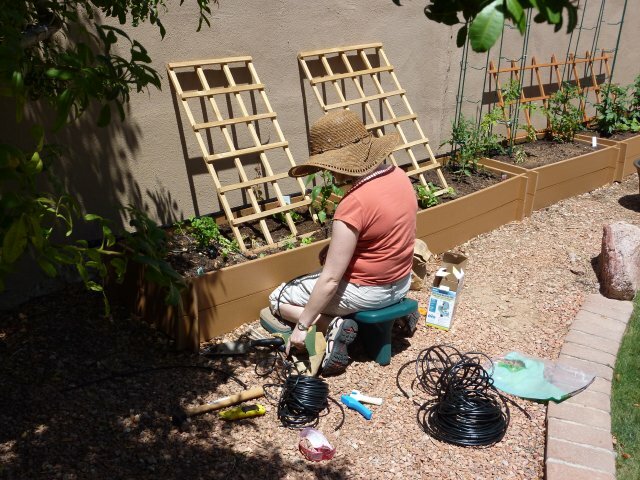 This is me setting up irrigation for my container garden a couple of years ago. Which I did for one season. Before it shriveled up in the desert sun and all died. Experiment: failed. Lesson learned: I am not a green thumb. 2. 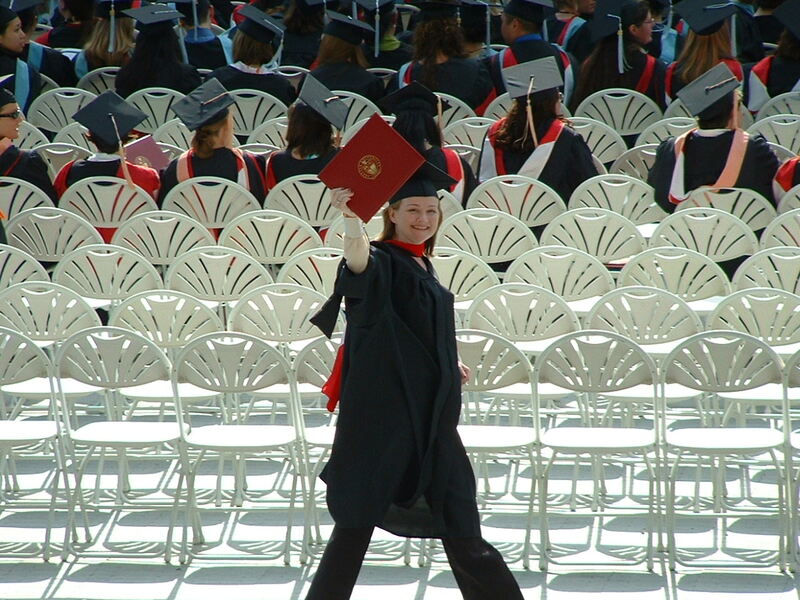 One of the things I’m proudest of is my Masters degree in Transforming Spirituality from Seattle University; not because having a Masters degree makes me “all that”, but because I worked hard for it and it continues to teach me a lot about living my life authentically. It taught me to ask questions so that I can be aware of my choices and experiences as my life story unfolds. That's me only moments after walking across the stage, so happy. 3. When I am not writing blogs or working on my books, you will find me working on drawings for patent applications to illustrate how an invention works. Below is Ninja Kitty. While she is not a drawing from an application, she is in the style of the work I do as a Technical Draftsperson. 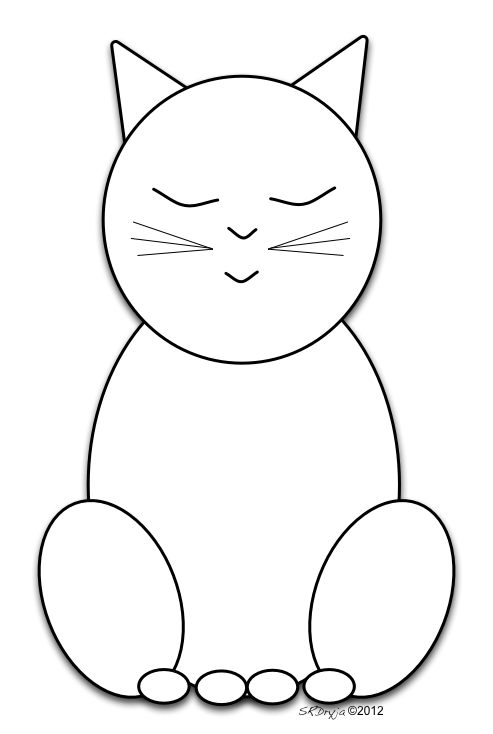 Ninja Kitty and her meditative counterpart have inspired my store and a line of products I created at Zazzle.com. 4. I cannot dance. I thought I could when I was a kid. My sister and I would listen to Neil Diamond and Barry Manilow while dancing all over the living room. Outside of that, though, I cannot loosen up enough to get into it and, when I dance with my husband, I always try to lead. The older I get the less self-conscious I become so, perhaps by the time I’m 80, I’ll be able to shake it all over the dance floor, just in time to break a hip. Look out nursing homes! 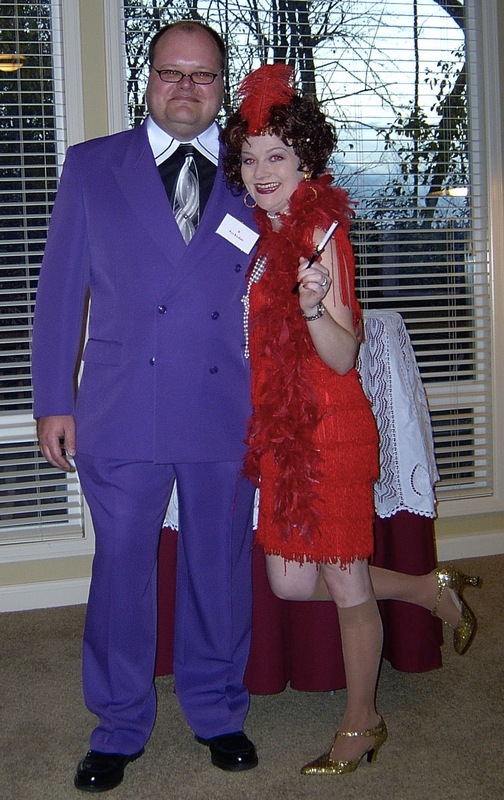 I will dress up like a flapper, but I cannot do the Charleston. It is very sad. 5. I. Love. Coffee. You probably figured that out just from the name of my blog. From the time I was a little girl, I was drinking coffee with my grandmother. To this day when I sit and have a cup of joe, I feel like she is with me, guiding me with her earthy wisdom. So, coffee has an appeal to me, both as something wonderful to enjoy, and as a connection to someone I love who has passed on. Espresso art in a cup from Royal Coffee in Phoenix. The art comes from the little splatters made when the espresso is made and how the crema rings down the cup as I drink it. 6. One of my favorite parts about travel, my favorite parts about life really, is people watching and people listening. The stories of others fascinate me and nothing impresses me more than when I see someone living out their life with courage, passion and, often, tenacity. People inspire me. I guess that’s why reading other people’s blogs is so inspiring. 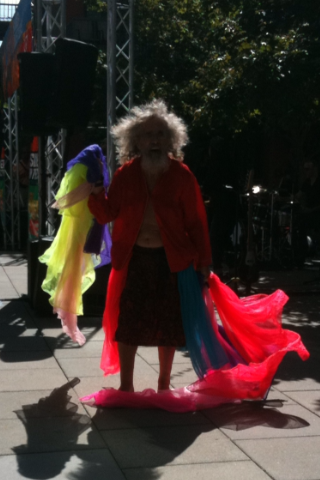 You may recall having seen this man in my Seattle article. To this day I think about him when I think of opportunities missed for getting to know an interesting person. Even so, his passion continues to inspire me! 7. I am an introvert. I can be very outgoing. I love meeting new people. But I must, must, must have significant time in my week to be quiet and still, to listen to the birds, or watch the wind tickle the leaves in the trees, and to write. I must have this time to allow the jumble of sights, sounds, and experiences to settle quietly in my mind so that I can truly savor and appreciate them. Then, I can go back out into the world and be extroverted again without being fake about it. Nature helps me relax and refocus. 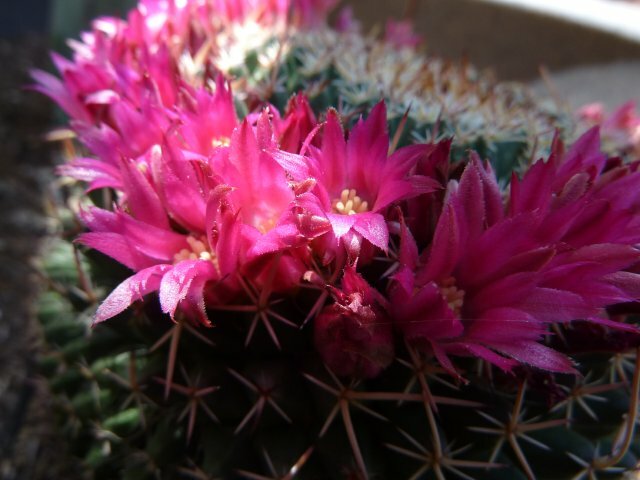 This is a cactus that bloomed in a container in our backyard. MyTown366: Set in the metro area of Phoenix, Arizona, this blogger never ceases to amaze me how she can capture some of the same places I go to on a regular basis and make them new just by the way they appear in her pictures. Her photos come from several different parts of the metro area and are inspired by daily life lived there. Going Dutch and Loving It: Malou is a versatile blogger in that she shares several facets of her life–from travel, to cooking, to life as a woman who was born and raised in the Philippines now married to a Dutchman and raising her own daughter in the Netherlands. Her blog has gorgeous photos of tulips in Holland, sunsets in the Philippines, and sunny avenues in France. Ms Elena Levon Traveling: What’s not to love about Ms Elena? She is a 28-year-old marvel. Her stories and photos take her readers on a fantastic journey to the hills outside of Los Angeles, the crags and crevices of Marrakech, the sand dunes of the Sahara–and they almost always overlap with the incredible people she meets. Reading her blog gets my travel itch started all over again. Spiritual World Traveler: I am just getting to know this blogger’s adventures through the bright enthusiasm of her posts around the world. Like Ms Elena, she inspires my own travel dreams. Traveling Chicha: This blogger says on her site that she is “resolved to do anything that sparks enthusiasm in my heart” and, from the looks of it, she is living this resolution fully. Aside from enjoying her adventures, I actually learned some things from the layout of her articles, which I hope improves my own writing and flow of information. Bringing You Beirut: Beirut is just one marvelous setting from which this “English girl” writes. She tells of life, in all its ups and downs and curiosities, living with her young love, and traveling with him around the world. World in My Eyes-China & the US: The spirit of this blog is one near and dear to my heart. The husband and wife team, who make up the adventures found in this blog, share stunning photographs of their travels in China and the US. What they do with it, though, is what sets it apart and touches my heart most: they illustrate through their photography how very similar we all really are. It brings us closer and, for any who might fear “the other”, their blog shows how we’re really not “other”. We are unique, of course, but we’re far more alike than different. I love it. Thank you! I am very flattered! I have really enjoyed reading your blog and look forward to our continued conversations. A big thank you again! Would you be interested in guest blogging on TravelingChicha.com? That would be wonderful! Thank you! I have never done that before, so you will need to fill me in on what you need and how to go about it. Shall I email you at the gmail link you provided on your site? I’m SO flattered!! My first award!! I look forward to catching up on your blog! because you dance through life with so much passion! And besides, who wants to dance the steps which already been danced by so many..
You are making your own steps and that’s breathtaking! You are so sweet, Elena. I would love to hang out over coffee someday and share stories. I am open to dancing, just not very good at it, and I’m okay with that. 🙂 Still, I don’t turn away from an invitation to try something new, even if it’s something old that I haven’t tried in a while, so count me in. I thought of you today when I came across a quote from Eleanor Roosevelt: “We gain strength, and courage, and confidence by each experience in which we really stop to look fear in the face… we must do that which we think we cannot.” You seem to epitomize this and I couldn’t help but think of your poor swollen ankle and your desire to keep climbing in spite of it. Hello Sherry, you are amazing and truly deserve it! I am not an introvert but I also like to have 1 day to be quiet, just to be alone and recharge, mostly after a weekend I have a long nap on Monday or Tuesday morning, just once a week then I’m all good. Naps are good, by the way, and I love that you take the time to give yourself one every now and then. I hope you are having a great week. I haven’t seen any posts from you yet, but I am guessing you are out living life rather than writing about it just now. Can’t wait to see what you’ve been up to. Sherry, I just got the time to absorb this wonderful entry and as always find my way chuckling through your commentary and thinking how much I relate to your point of view. Thank you again for the award and your very thoughtful introductions to other blogs you’ve found… I can’t wait to visit them! Your “7 things about you” is brilliant. #5 ~ I had similar experience with my mom… special times. 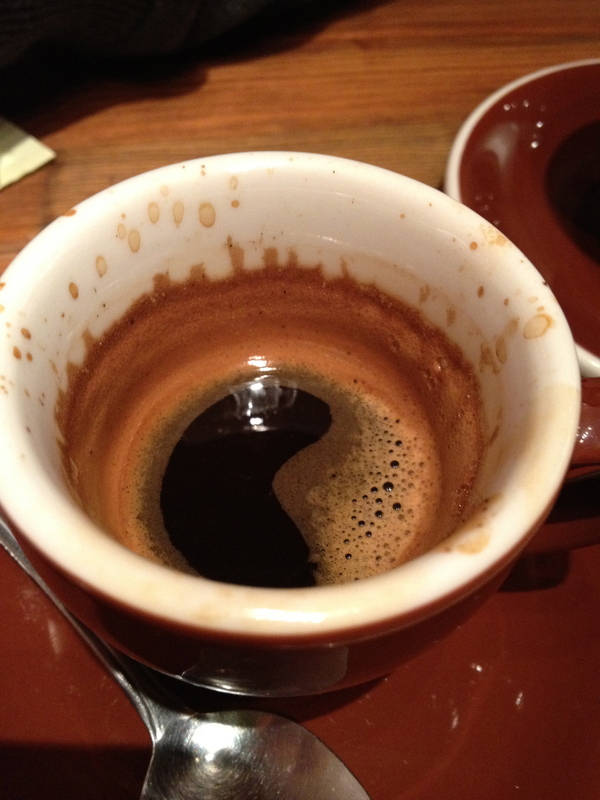 This also reminds me of a Turkish coffee fortune-telling practice/pastime… are you familiar with it? #6 People watching is the BEST for all the reasons you present…. Thanks again! That is so cool, Kristasta! I have got to seek out a “coffee fortune teller” when I go to Turkey (one day)! I love stuff like that!